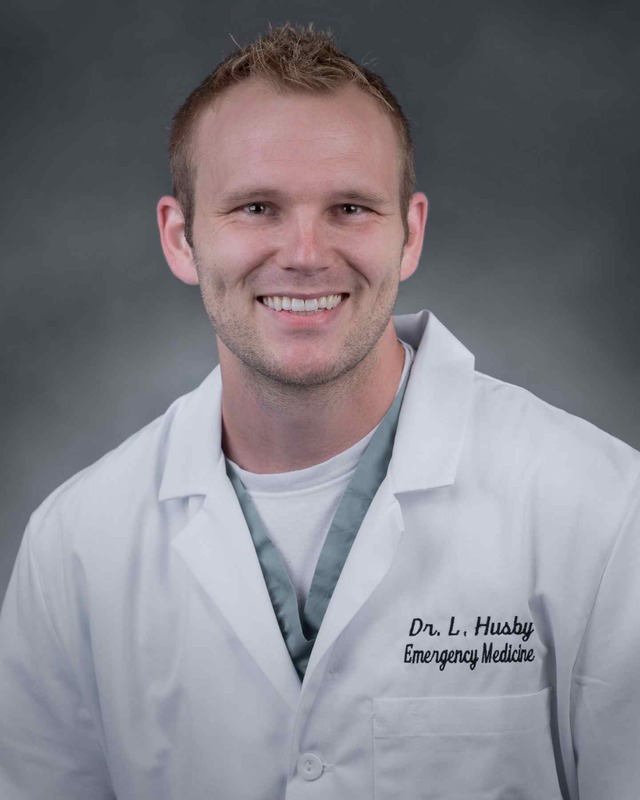 Dr. Husby is a graduate of North Texas State University and is chief resident of the Palmetto Health Emergency Medicine Residency, class of 2016. After over 24 hours of travel we arrived to a 5 hour van ride to rural Masindi, Uganda over the two paved roads in all of Uganda. 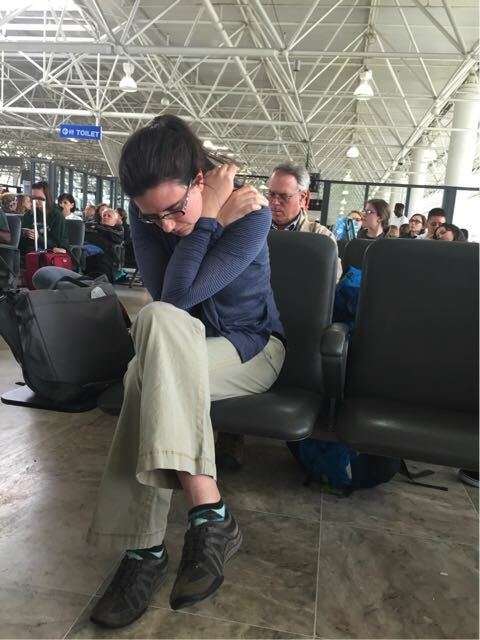 The travel was fairly exhausting and Heather Brown needed a nap at the Addis Ababa Airport in Ethiopia during our layover waiting to head to Entebbe. 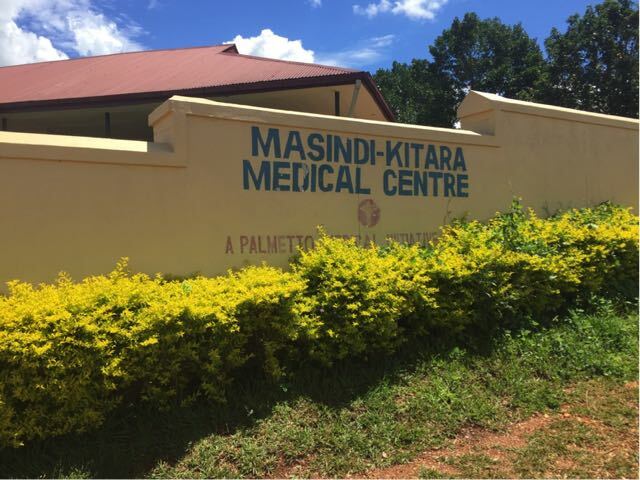 The Masindi-Kitara Medical Center (MKMC) is a fully functional hospital in Masindi, Uganda run by Palmetto Medical Initiative (PMI), a nonprofit organization based out of Charleston, SC. MKMC has multiple nurses, an inpatient ward, obstetrics, gynecologic, surgical, and outpatient wards. It has recently established itself as a low cost self sustainable private clinic to offset the two opposing ends of the spectrum with higher end private clinics on one end and sometimes difficult to access free government run clinics on the other end. PMI conducts mobile clinics on a quarterly basis in the communitites surrounding MKMC. Pictured below it their donated ambulance. 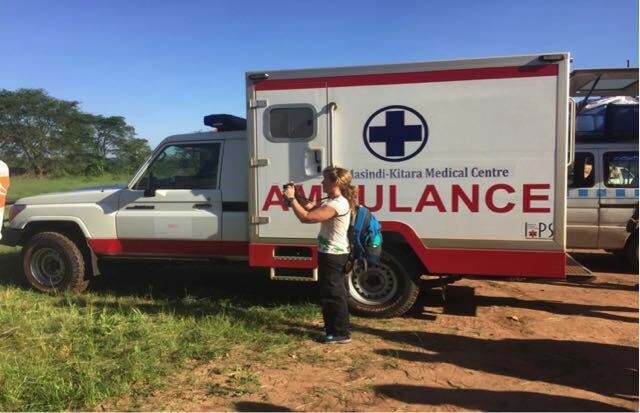 It is likely the most highly equipped ambulance in Uganda, as it includes oxygen tanks. 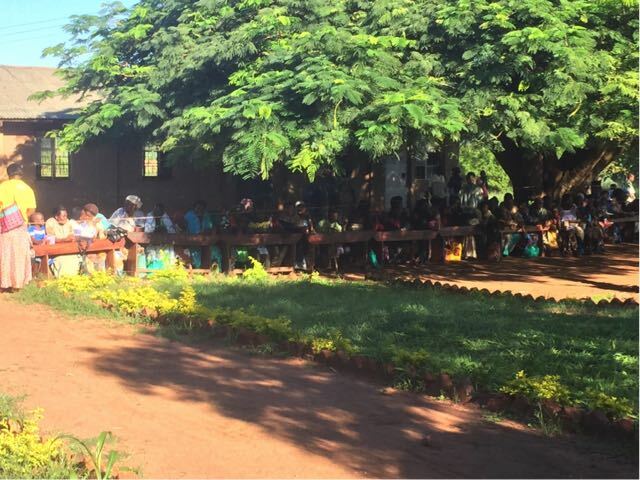 Days 1 & 2 of actual clinic days began Monday at the same site a primary school near to our Masindi Hotel. There was an extensive line when we arrived to see the "Mzungu Doctors." Roughly 350 patients were seen between those two days. The room pictured on the right was one of the provider rooms where 4 providers and their interpreters sat at desks to see the patients before they go to the pharmacy or physical therapy/occupational therapy clinic room. All services were free. Referrals were given to MKMC whenever needed for followup. 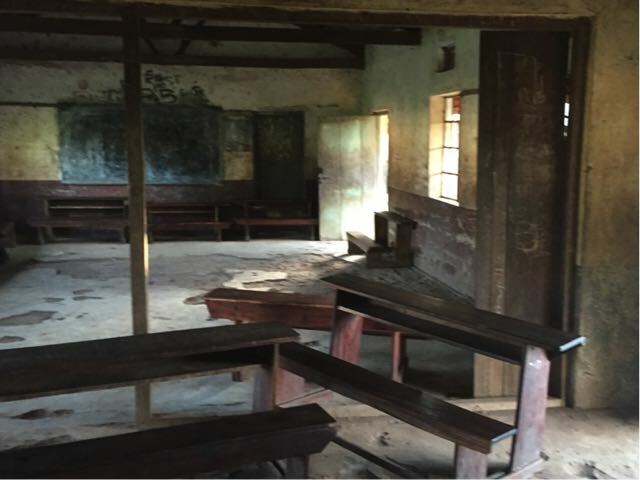 The primary school on days 1 &2 was built in 1926. Day 3 a couple hundred people waited outside another primary school to be seen. 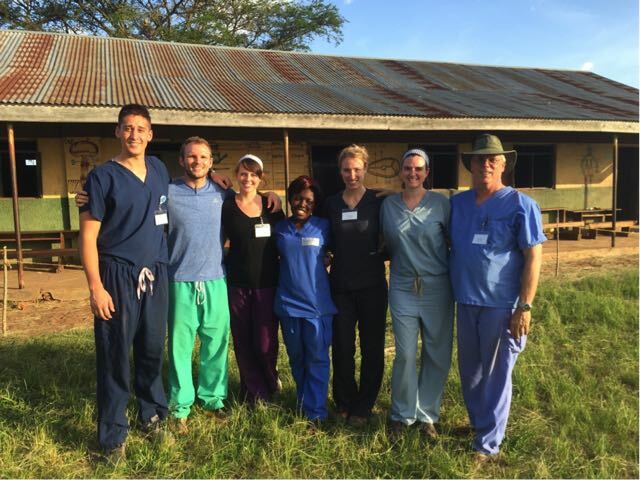 This was a 3 hour drive out to a more rural area to provide difficult to access medical care. 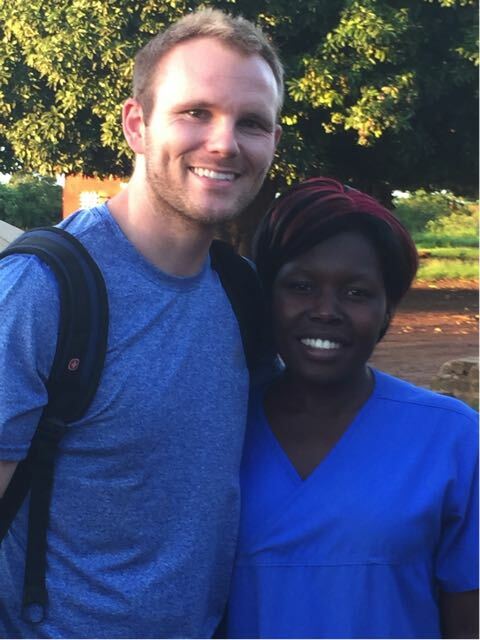 Pictured on the right is Luke Husby and Naomi one of the MKMC nurses that primarily assisted with prenatal care and screenings. 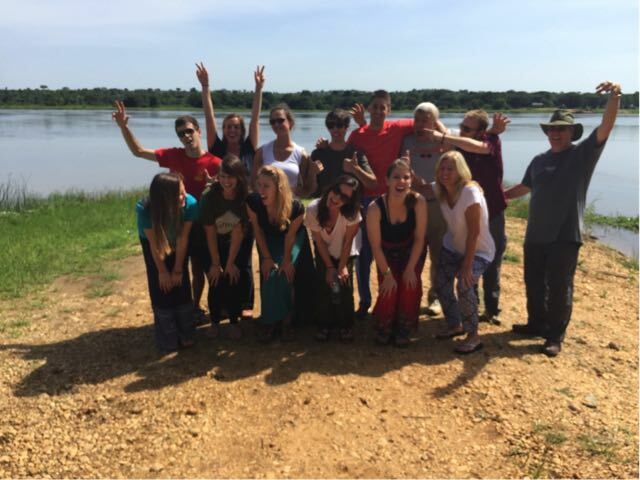 All of the translators, pastors, and Ugandan assistants were seen in return for volunteering with us. The child pictured on the left was found to have difficulty sitting up due to her cerebral palsy. 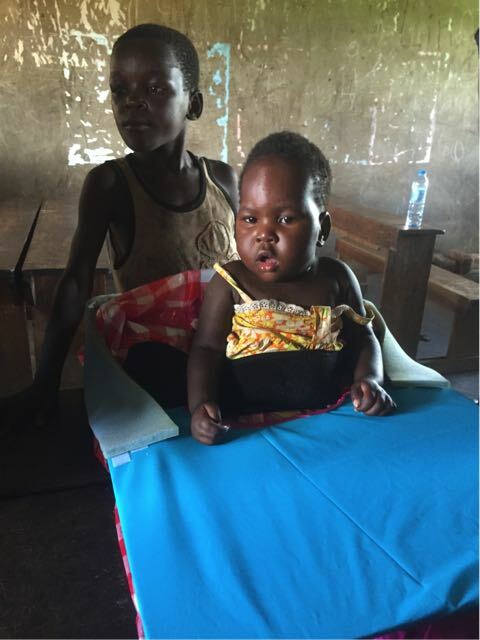 The occupational team created a seat with some foam and cloth so that she could sit upright on her own. 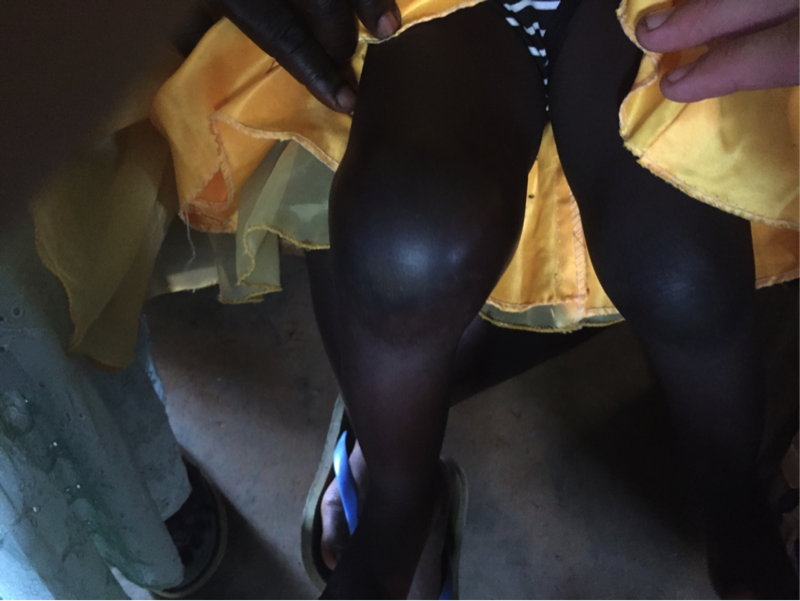 The child pictured on the right came to us with a swollen knee for 10 days and fevers. 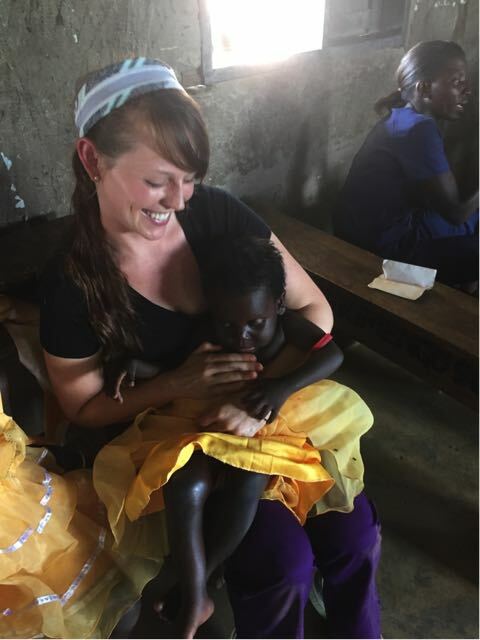 She was ultimately diagnosed with a septic joint and had the knee washed out the following day at MKMC by a local multifaceted physician named Dr. Godson. Antibiotics were given when seen and immediately sent by ambulance to (MKMC). Pictured on the left is our PICU nurse, Kristen, calming the patient with a septic joint. Each of the patients were seen be a provider and student. Patients would regularly wear their nicest dress to be seen by the Americans. 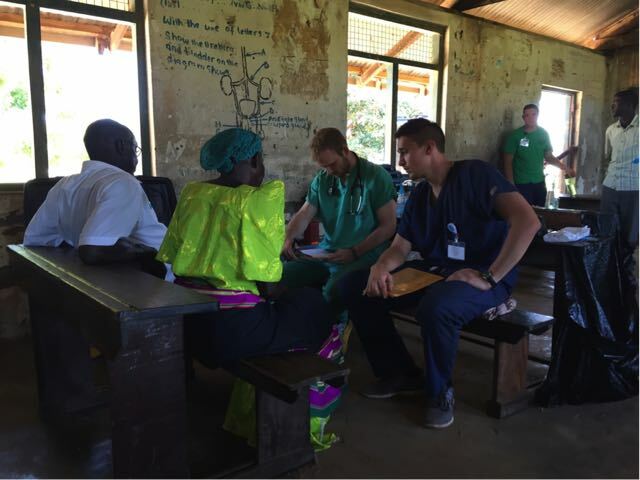 Below is a picture of Luke Husby interviewing a patient while he sits next to Alex, a future DO student. On the right is a picture of all of the providers involved in care. 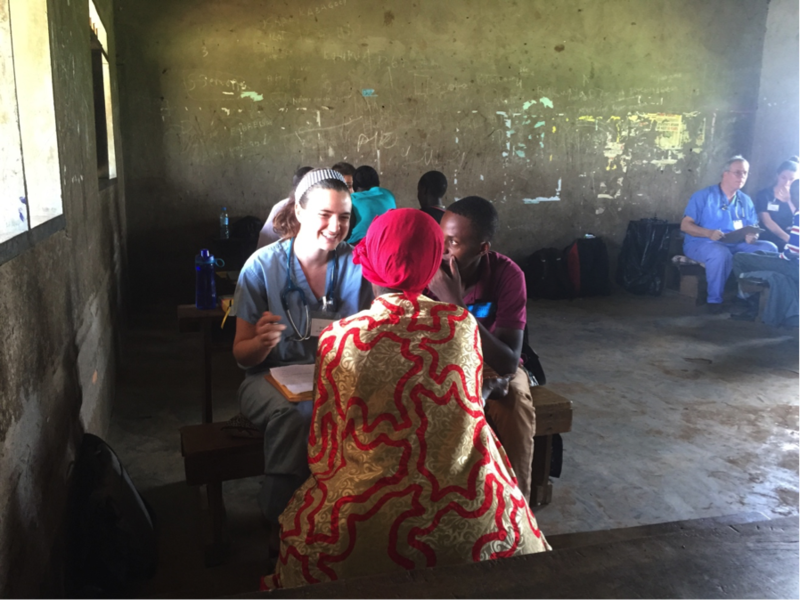 Pictured on the left is Dr. Heather Brown with her translator, Armstrong, seeing patients during one of our last of 5 clinic days at another primary school. In the background Dr. Bolt, a family physician is doing the same. 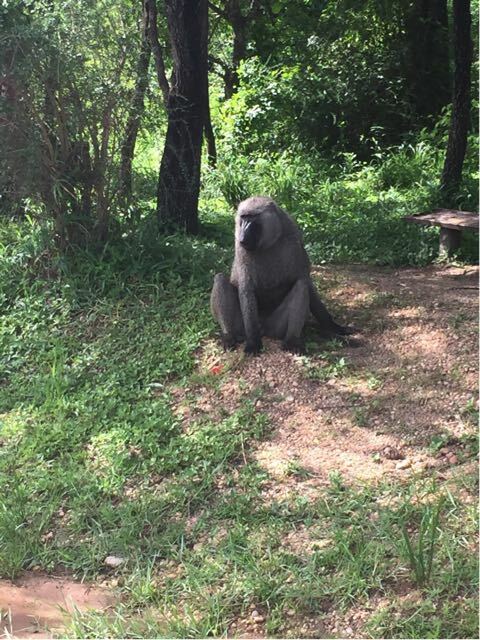 Baboons were everywhere. Some more tame than others. This one posed for a few close up pictures before barking away the visitors alongside the road. 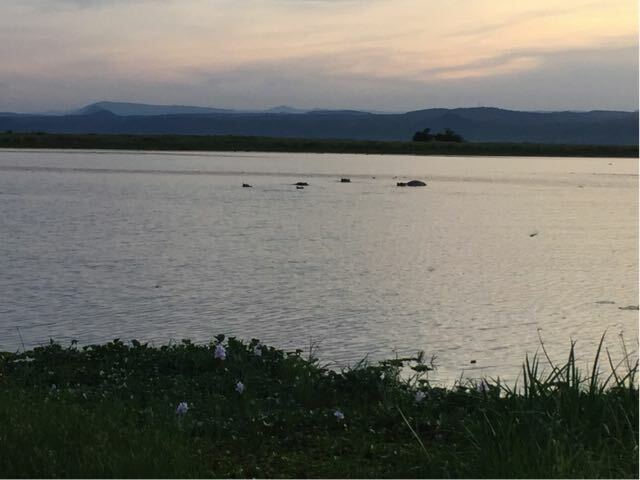 Pictured on the left is all of the non PT/OT personnel goofing around with the Nile and a few hippopotami off in the distance. Those hard to see "rocks" travelled alongside our ferry when we crossed over to get to the Paraa Lodge prior to our safari. 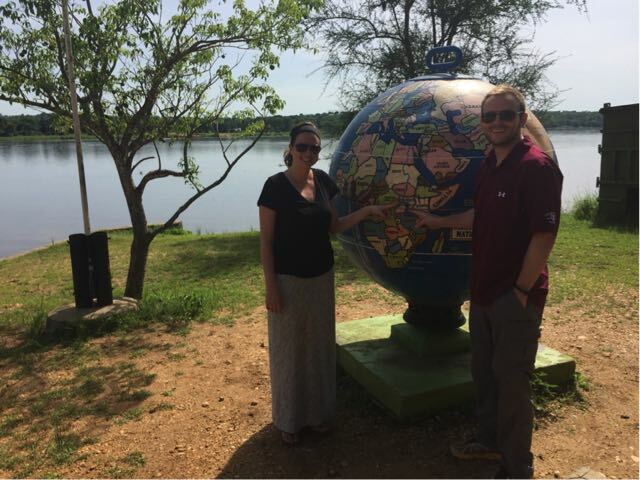 Pictured below, Heather Brown and Luke Husby pointing out proximity to the equator on that sunny Saturday morning by the Nile. 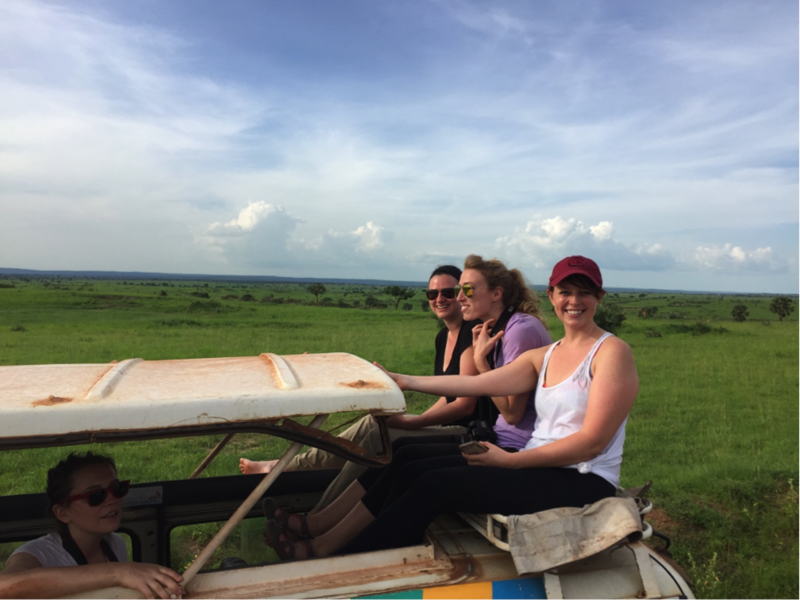 After a long week of clinic, we were treated with a day of relaxation by the Nile River and a sunset safari in Murchison Falls National Park. 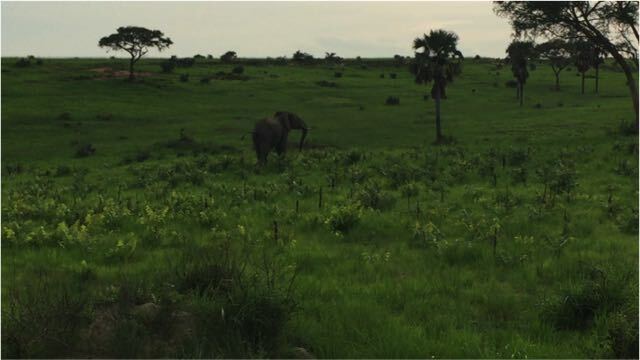 Here are some of the highlights: Below is a clearly male elephant, who immediately prior to being photographed began to charge the vehicle then turned away huffing and puffing. 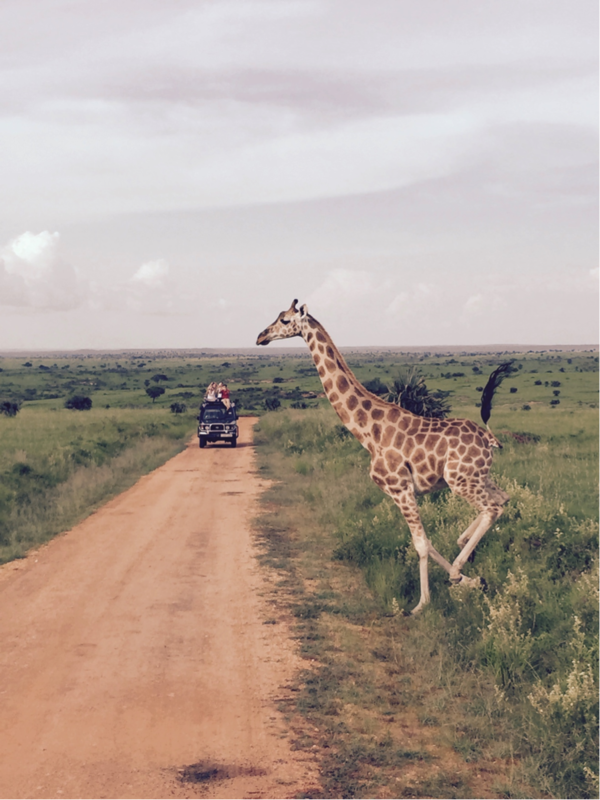 Luke Husby along with other team members riding on top for the afternoon safari. A yawning lion. (Not a zoomed picture by the way.) 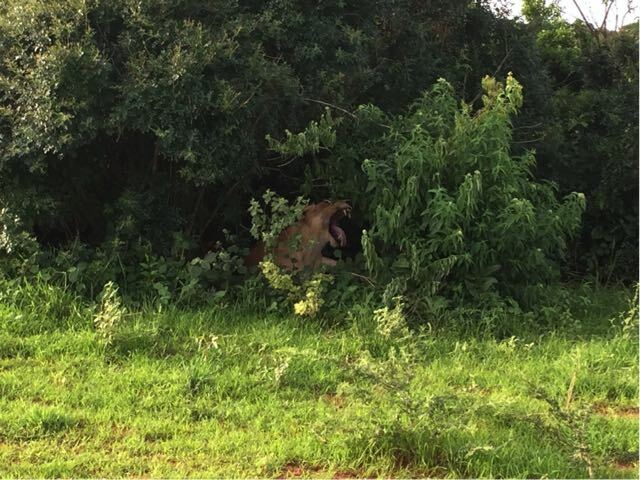 She was only a few feet away sitting in the shade with her cub. Lounging hippopotami in the Nile River at sunset. 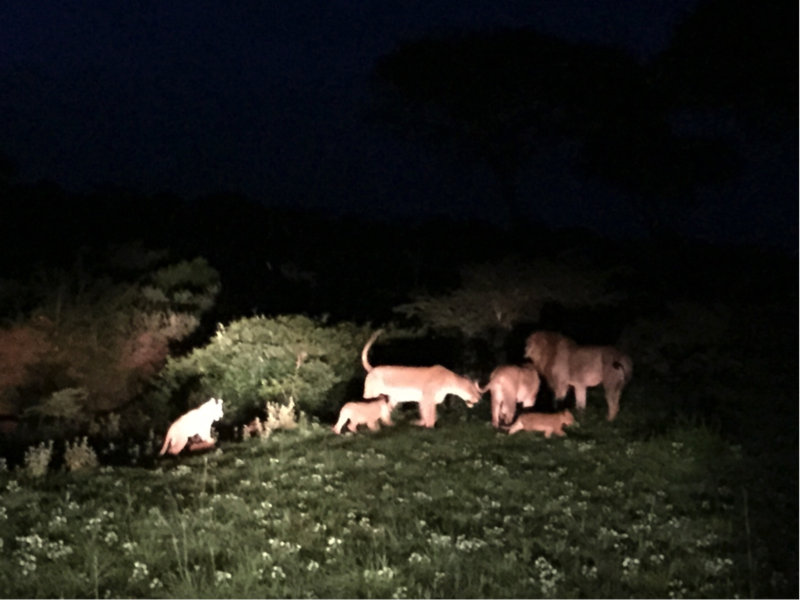 Pictured on the right is a night time view of a more active pride with the somewhat elusive male lion, his two females, and three cubs coming out during the cooler evening time. Everything comes out at night. 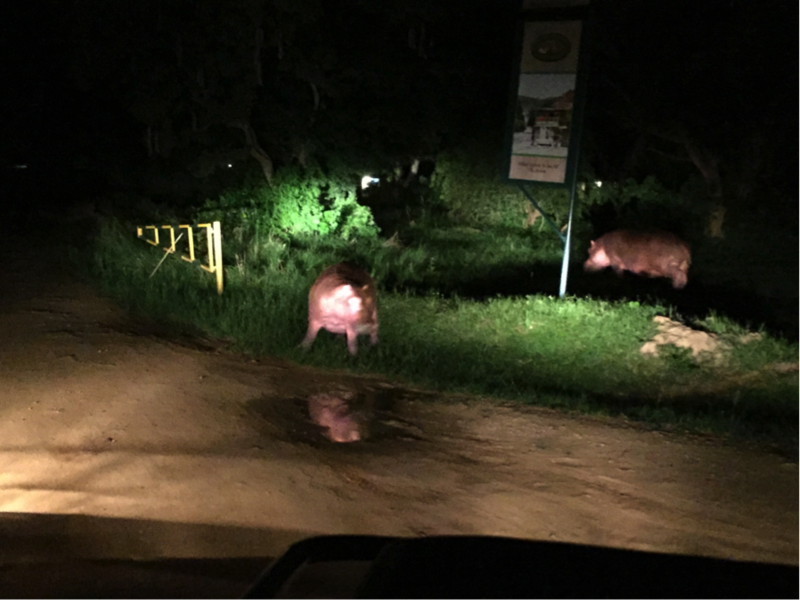 These hippos greeted us at out hotel gate entrance after the safari. 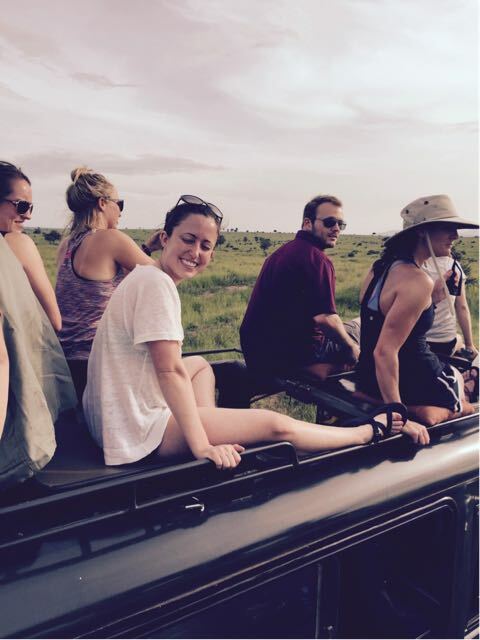 Heather Brown and some of the other providers riding on a van during the safari. After 5 days of clinic and 1 evening of safari we returned via a 40 hour travel day to enjoy some of the comforts of home.